Some people practice Zen to relax, I make mosaics. 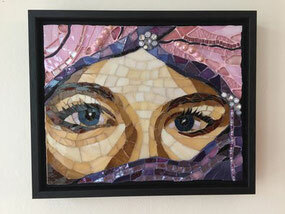 Some play music to unwind, I make mosaics. After a stressy work day, I cannot wait to make some mosaics. And if I am not making any, I am thinking about making some. In fact, if you catch me in a blank stare, I am probably thinking about my next mosaic. Over the years all this relaxing and unwinding has resulted in pretty large collection of mosaics, and it was time to pull them all together and show them off! So here they are, grouped by shape or function. I hope you enjoy seeing them. If you do, please know that while most of the mosaics shown here have already been given away or sold, anywhere between 20 and 30 items are usually for sale on Etsy. And I do commissions. If you want to discuss how I can make something for you, please contact me. If you want to find out what I will be making in the future, please follow me on Facebook. Or follow my Pinterest page. Oh, and I have a really cool video of how to make a mosaic peace sign right here. Please do not copy any of the artwork without my permission. If you want to use any of the images from this site, please send me a note. I'll likely ask you to simply link the picture back to me wherever you wish to use it.